On Sunday, August 5, residents from Revera's Main Street Terrace joined seniors from Toronto's east end to enjoy a matinee performance of a brand new musical about life in long-term care. 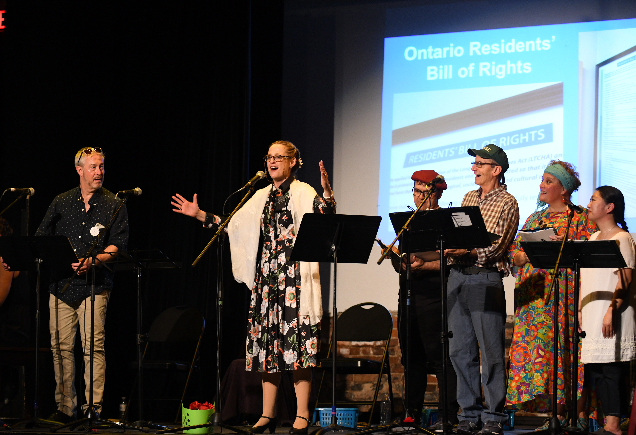 Staged at The Redwood, a new arts venue near Greenwood and Gerrard, "Senior Moment" told the story of five residents joining forces to save their facility from demolition. The show featured ten original songs covering topics ranging from the perils of aging to agency and empowerment. Audience members booed the villain, the smarmy developer and politician Raymond O'Leary, and cheered for Ernie, an aphasic resident who unexpectedly saves the day. Show creator Jill Leger drew on her own experience as a recreation therapist for seniors. The residents thoroughly enjoyed the theatre and especially seeing Jill on stage. "Our residents certainly enjoyed seeing aspects of their own experiences reflected on stage," said Jane Devine, Main Street Terrace's Resident Services Coordinator. "Here's hoping this show can be staged again!" In photo: Jill Leger takes centre stage along with other cast members of the musical.